The deeper orange (1.6 microns) moves farther into the infrared region of the spectrum. Image taken with HST's Near Infrared Camera and Multi-Object Spectrometer (NICMOS). It is a common type of spiral galaxy in which the pinwheel-like arms arise from each end of a bright central bar of gas and stars rather than from the center as in normal spirals. Although astronomers aren't certain how a bar forms, they believe it may be created by instabilities in a galaxy's disk of gas and stars, perhaps caused by an interaction with another galaxy. In Hubble's close-up view of the core of NGC 1512, the bar is too faint to see. The colorful picture is representative of the galaxy's natural colors. Blue depicts hot, young stars; red, cooler, older stars. The photo is a color composite created from seven images taken with three different Hubble cameras. The composite shows the full range of wavelengths, from ultraviolet to near infrared, covered by the Hubble telescope. Although ultraviolet and infrared wavelengths are invisible to the human eye, astronomers have "color-coded" them to show important details in the starburst region. The bright blue clumps are star clusters observed in ultraviolet and visible light. 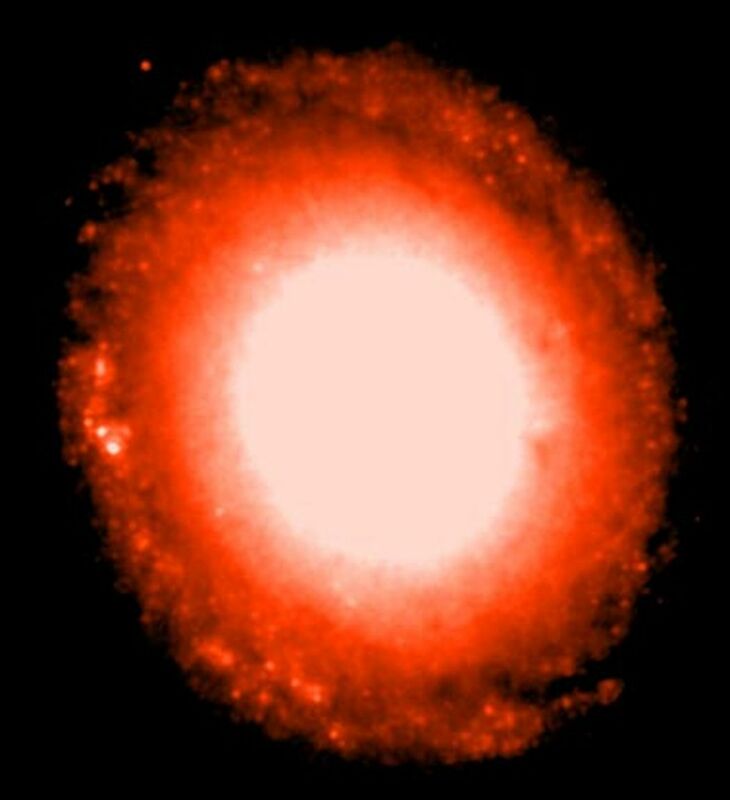 Infrared wavelengths, shown in red, reveal gas clouds illuminated by radiation from hidden clusters of young stars.